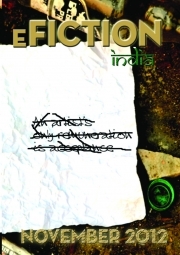 Description of "eFiction India Vol.01 Issue.02"
eFiction Publishing is a periodical production company that delivers the best in short fiction in a monthly fiction magazine. While there are many hundreds of short fiction magazines on the internet, eFiction has set itself apart as a leader in innovation of the art in both content and form factor. The magazine is conceived as a dialogue — a platform which carries the best of contemporary writing in India. It is not India-specific and addresses a community which is more easily defined in terms of mindspace rather than in purely geographical terms. It also is leading the pack in digital delivery with each magazine available in all formats on the date of publication (iOS / Android apps in development). The company focuses on community power to keep the magazine running. The eFiction community of writers and readers volunteer their time and energy to produce the magazine each month. Instead of locking down the production and selection of stories to a chosen few editors, eFiction has flipped magazine publishing on its head. The company allows readers to volunteer to read story submissions and vote on them The highest voted stories are selected, edited, and then put into the issue. You’ve never read a magazine like this. This Magazine has authors of Indian origin around the world and not just people living in the sub continent. The writers in this issue include Shifani Reffai, Pranay Mathur, Rajesh Rao, Murli Melwani, Ananya S Guha, Michelle D’costa, Sheikha A., Ananya Dhawan, Pallavi Vyas, Heena Ahuja and Siddharth Sehrawat. Reviews of "eFiction India Vol.01 Issue.02"